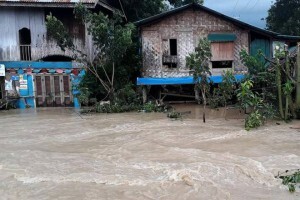 By Thursday morning the water was receding, but two people remained missing and were feared to have been washed away, said Min Thu, deputy administrator of Yedashe. “People whose villages are on higher ground are preparing to go back to their villages,” he told Reuters. The ruptured spillway had flooded 85 villages, affecting more than 63,000 people and submerging a section of highway, the Global New Light of Myanmar newspaper said. Traffic between Myanmar’s major cities of Yangon and Mandalay and the capital, Naypyitaw, was disrupted after the flooding damaged a bridge on the highway linking the cities. A priority was to get as much water into the reservoir as possible before the dry season when it is needed for irrigation, said Kaung Myat Thein, an irrigation official at the Ministry of Agriculture, Livestock and Irrigation. He said a probe would seek the cause of the dam breach. “The retaining wall of the spillway sank into the foundation about 4-5 feet, causing the flooding, but the main dam is intact,” said Kaung Myat Thein. Days before the breach, authorities had given the all-clear to the dam, which can hold 216,350 acre-feet of water, despite residents’ concerns about overspill, state-run media have said. Kaung Myat Thein said the dam was regularly inspected and a spillway collapse could not have been predicted. Residents ran to higher ground to escape the floodwaters, he said, but many lost their homes and possessions and were expected to ask the regional government for compensation. “My house was at the northern part of the village and all houses in the northern part didn’t survive,” said Pan Ei Phyu, 24, a villager who escaped with her family, buffalos and cows.